Life, Love & the Pursuit of Chocolate...: Are we there yet? While I am excited about Thanksgiving, the last couple days have been somewhat exhausting and stressful. We left Kentucky yesterday and drove 6 hours to Memphis, stayed the night, and are completing the last 6 hour leg of the trip to Gilmer, TX as we speak. It's been an adventure to say the least! I woke up yesterday knowing I had a long day ahead of me. I took a vacation day yesterday, but that didn't stop me from getting up at 7:00am and working until about 10:30am when I finally slammed my hands down on my laptop, silently told it to f**k off and slammed the door to the bedroom for good measure. Needless to say, I was having some issues with my work computer, and trying to put out last minute fires before I left for Texas. Not to mention I still hadn't packed, and had 3 loads of laundry to do before I could pack. 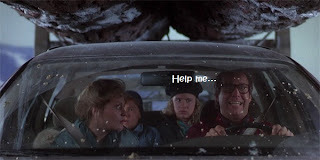 Whew...aren't the holidays grand?!? Anyways, I finally made it out the door after giving the boy a goodbye kiss (he couldn't come with us to Texas because of work) and off to Louisville to meet up with the family and pick up the rental van. Ummm....has anyone else rented a car lately? Let me tell you, it ain't fun! Me: Here, put it on my debit card. Bitchy rental agent #1(BRA#1): Umm, okay in order to put it on your debit card, we need to see 2 copies of up to date utility bills. Me: Umm, I have some mail with me, but I don't know if it will work. BRA#1: Well, if you have online access to your accounts, you can just print them out on our computer. Or a pay stub would work too. Me: Why would I have a pay stub with me? Here...I have a statement for my car loan and the mortgage on my house. Those are current. Would those work? BRA#1: No. It has to be a utility or phone bill. Me: I have my bank statements that show money in my account...can you use those? BRA#1: No. We can use your cable bill, gas bill, electric bill, phone bill, water bill or pay stub. Me: Okay, well I just moved. I can probably get my electric bill pulled up online, but my Insight account is closed, and I don't have online access to my water bill. Everything at the new place is in my fiance's name. Bitchy Rental Agent #2: The problem with a debit card is that you could give us that and close your bank account. People steal cars like that. So we have to have some way to verify that you make payments and are in good standing. Me: And my mortgage payments, car payments, and bank statements won't accomplish that? Me: I don't understand....I've never had a problem renting a car before when I travel for work. I've never had to bring utility bills. BRA#2: Well, what did you use to rent the car then? Me: My corporate credit card. BRA#2: Well, why don't you put it on your corporate card? Me: Because I'm making a personal non-work related trip for the holidays. BRA#2: What about a cell phone bill (looks the the phone in my hands). Me: This is a corporate cell phone. I don't pay the bill. So, rental drama aside, we finally made it out of Louisville around 4:30 yesterday. I would have been more joyous, except as soon as I crawled into the back of the van, I remembered how horrific family road trips are, especially with my family. There was nothing left to do but hunker down and pray for daylight...or vodka. We were on the road all of 15 minutes before someone put on Mary Poppins in the portable DVD player, which luckily for us was in surround sound (and by surround sound, I mean my mother singing along to Spoon Full of Sugar and Supercalafredulisticexpialidocious). Luckily she fell asleep before we were graced with her rendition of "Chim, Chiminey Chim Chim Cheroo", but she woke up just in time to hear everyone argue about where we were stopping to eat and to repeately chant "Mama's gots to pee!" until we finally stopped at a Panera Bread in I'm-in-hell, TN. Next up was "That awkward moment when you get to Memphis and you're sharing a hotel room with your parents and sleeping in a double bed with your 16 year old sister". At 27, I thought those days were over, but sadly, they are not. Good thing I was so damn tired it didn't matter...I quickly fell asleep and was delighted to wake up and find no bruises on my legs from sleeping with "The Sleep Kicker" (aka, my little sister). Now we trudge on...we are just over 3 hours into todays trip and have already stopped twice for various family members to go to the bathroon. We have also made it all the way through one of the Harry Potter movies and have moved on to Finding Nemo...it was a strategic move not going with a musical this time. I might have thrown myself out the window. The good news is that there is light at the end of the tunnel....in a few hours we will be in Texas and joing my sister and her husband, my cousins, grandma and grandpa, and aunts and uncles, and hopefully a bottle of pinot grigio as well. Our actual Thanksgiving won't take place until Friday though...my uncle got all the men tickets to Texas vs. Texas A&M football game on Thanksgiving day and they will be traveling and tailgating for that all day tomorrow. No matter though...good things come to those who wait. And be good things, I mean Cranberry Fluff (aka the best thing you'll ever put in your mouth). It is far and away my favorite t-giving dish and maybe one of my favorite foods, period. I'll try and post the recipe and some pictures too. It's freakin' divine. So that's pretty much been the last 24 hours of my life. I am anxious to get there and start of the holidays with my family, though it will be bittersweet since my sweet boy won't be there. I can't wait to get home and put up our first Christmas tree together! 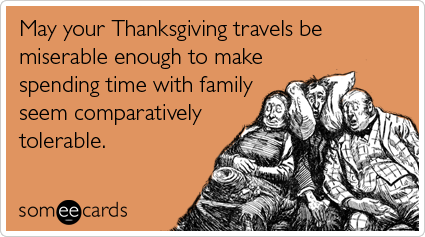 I'm curious how some of my readers are spending the holidays...What is your favorite/least favorite things about Thanksgiving? What is the one Thanksgiving food you look forward to all year? ?